Della Porta Agency, LLC has been helping individuals, families, and business owners realize their financial goals since 1985. We are a premier financial services firm comprised of talented, competent, and successful associates who conduct their business with integrity. Our office provides financial guidance to our clients, each with unique financial needs. Our reputation is based on the strong relationships we have formed with our clients and our commitment to excellence in all we do. 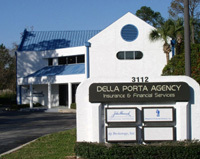 dp Brokerage is a contracted General Agent of Florida Blue, formerly known as Blue Cross Blue Shield of Florida. dp Brokerage offers individual health and group products, employee benefits and disability income insurance for individuals and business owners. Allegiance Financial Advisors** is an Independent Registered Investment Advisor providing asset management and financial planning on a fee for service basis. Clients with significant net worth can participate in the management of their assets with the assistance of qualified investment advisors. The entities that encompass the Della Porta Agency, LLC were all created with one objective in mind - to offer clients excellence in investment and risk management services through quality companies and impressive client services provided by qualified professionals. Our organization is comprised of a dedicated team of professionals with a wide range of backgrounds and disciplines - in finance, insurance, and investments. Our strategy embraces a team philosophy when working with our clients. Each representative is responsible for understanding his or her client''s financial picture, applying a comprehensive strategy, and providing the appropriate resources to meet their clients' goals and objectives. We encourage our clients to leverage existing relationships with their trustees, attorneys, and accountants to ensure that our associates can take a comprehensive approach when creating financial solutions. We take a personalized approach to help you build, maintain, and protect your assets with our full range of products and services backed by our commitment to always maintain our relationship with you. For more on how we can help you with your financial goals, please contact us today. **Securities offered through Royal Alliance Associates, Inc. (RAA), member FINRA/SIPC. Investment advisory services offered through Allegiance Financial Advisors, Inc. RAA is separately owned and other entities and/or marketing names, products or services referenced here are indepdendent of RAA.